There’s been a lot of speculation on CM Punk’s UFC future. Dave Meltzer of The Wrestling Observer Newsletter noted this week that there are numerous accounts that say Punk has been working hard but he has not progressed well as a fighter. Punk has participated in live sparring sessions at the gym and there have been a lot of rumors about how he looked but it’s been consistently said that he has not fared well. UFC originally hoped for Punk, who has had to delay his training at times due to back and shoulder injuries, to debut in the summer of fall of 2015 but injuries and the way he adapted to MMA cause delays. UFC then looked at having him debut on the June 4th UFC 199 event in Los Angeles but that was changed when Punk underwent back surgery, the same surgery Cain Velasquez had a few weeks before Punk, and Cain is booked to fight at UFC 200 on July 9th in Las Vegas. 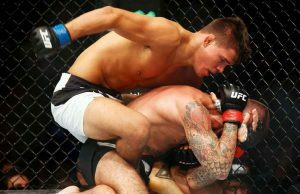 The Observer also noted that the general feeling is Punk’s first scheduled opponent, Mickey Gall, will probably run through him. It was pointed out that while there will obviously be a lot of buzz when the fight date is announced, UFC has kept quiet on Punk and lately he’s kept a low profile, away from the media. The main reason behind signing a rookie fighter like Punk was the major media attention. Meltzer believes if too much more time goes by without a fight date announced, that will be telling of the whole situation.